1st Place: Kevin Craft from Bixby, OK – Is It True? The judging was completed in a blind fashion. The authors names were removed from their essays and then sent to the judges. The judging was completed based on the criteria spelled out in the Essay Contest Guidelines: Quality of the Topic, Understanding, Presentation, References, and Details. Then younger participants scores were increased a certain percent depending on their age (for example, more for a 12 yo and less for a 17 yo). The final tally determined the winners. We will be posting the winning essays on our website over the next several weeks. Up next, we are now launching our 2010 Creation Essay Contest. Our plan is to make this an annual event. So if you are an Oklahoma student between the ages of 12 and 18 (as of June 15th, 2010), we hope you will be a part of the 2010 contest or participate again if you were part of the 2009 contest. Submissions are due June 15th, 2010 and the guidelines and registration forms can be found at http://www.jesuscreated.org/events/EssayContest2010.php There is only a little less than three months left before the deadline, so you will want to start ASAP. In addition to the $500, $300, & $200 cash prizes, the top three entries for the 2010 Creation Essay Contest will each receive a trip for four to the Answers in Genesis Creation Museum by JCM on August 12-14, 2010. Included are all transportation expenses, museum entrance and planetarium fees, 2 nights hotel, and breakfast during the trip. Other meal and extra spending money are not included. This trip will utilize the recently purchased 42 seat ministry bus. 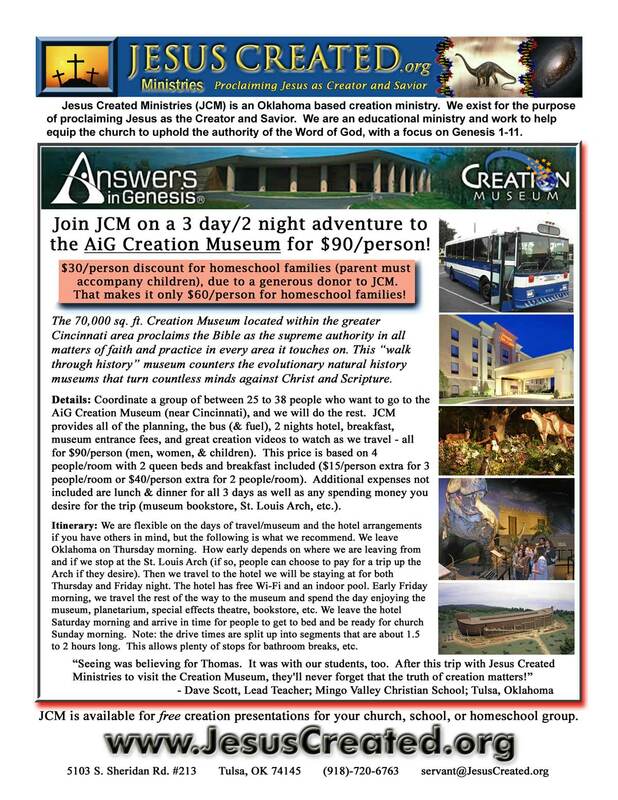 See the JCM AiG Creation Museum Trip flyer for more details. Furthermore, given the trip date, JCM will have the winners of the 2010 contest announced by July 15, 2010. Hopefully we now have the judging process down such that participants will not have to wait 9 months to find out who won! Proclaiming Jesus as Creator and Savior!